Noggin is a good and kind king, who looks after his people well, giving them warm socks to wear and food to eat, and making sure that they have good roofs over their heads, so when one of the Nogs asks Noggin to help him mend his roof, Noggin is happy to assist. Together they visit a farmer who gives them a ladder and some straw which they take to the man's house. Noggin climbs the ladder with the straw and starts to repair the many holes in the roof. In one of the holes he finds a mother bird with four babies. He takes the nest from the roof and puts it in a bird box in a tree in the garden of his castle. Noggin gives the mother bird some breadcrumbs and asks if he is king of the birds as well as king of the people. The bird eats the crumbs and flies away. Noggin then goes and finds Nooka, and asks her the same question. When Nooka asks why he wants to know, Noggin tells her that if he is king of the birds, he will be able to look after them as he looks after his people. As they talk, the mother bird returns and flies over them, with a little bell in her beak, and settles in the branches of a tree. As Noggin and Nooka approach her, she flies off into the forest ringing the bell. Noggin and Nooka set back for the castle, but the mother bird flies back to them. Nooka then realises that the bird wants them to follow her into the forest. As they venture into the forest, the trees soon block out the light and Nooka becomes nervous. As they are about to turn back, Noggin hears bells. The couple then see a mass of birds of all shapes and sizes, all carrying little bells. The birds fly deeper into the forest, ringing their bells, and Noggin and Nooka follow them to a large oak tree, in which sits a big, white owl. Noggin asks the owl if he is king of the birds. The owl does not answer, but flies to the ground as the other birds bring it twigs and feathers, out of which the owl makes a crown. 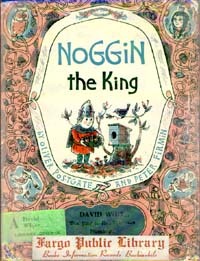 As the owl bows to Noggin, the birds pick up the crown, fly up into the air and place the crown on Noggin's head. Realising that he is now the king of the birds, Noggin returns home with Nooka to make homes and prepare food for the birds. They are led out of the forest by all of the birds ringing their bells, except the big white owl, who stays in his oak tree and shuts his eyes.